I started the youth weekend with an unsuccessful evening hunt. To make it worse, my friend down the street showed up at my house to show off his first doe. 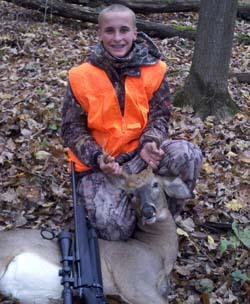 Now the pressure was on to not only get my first deer, but to get a bigger one than my friend. We left around 5am. We headed for a blind that my Dad had set up a week before. We settled in and waited for a few hours before some turkeys wandered by. About 30 minutes after the turkeys left, we heard a twig snap behind us. We turned around to see my buck. After some switching sides in the blind...I was able to find the buck in the scope. Without much hesitation, I pulled the trigger. It dropped quickly and I had my first deer and the first kill with my Dad's new rifle. Field dressed it was 116lbs and had 6 points.